Online Blackjack is widely regarded as one of the most entertaining and playable online casino games. Cryptologic online casinos offer you over 7 different blackjack games in download package or "instant play" mode plus several multi-hand (play up to 5 hands at a time) and multi-player versions. 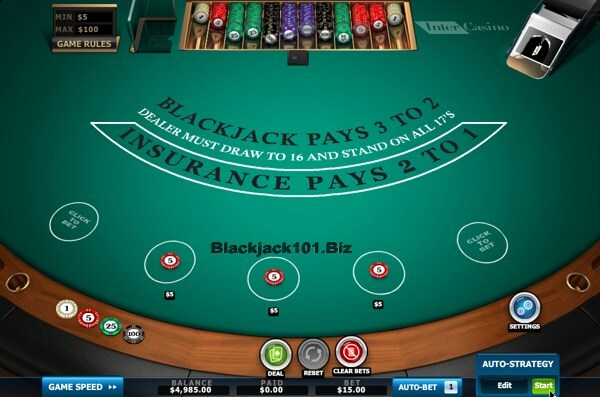 The game list includes popular variants such as Atlantic City Blackjack, European Blackjack (+ 2 Deck), Vegas, One Deck, Perfect Pairs and Progressive blackjack. 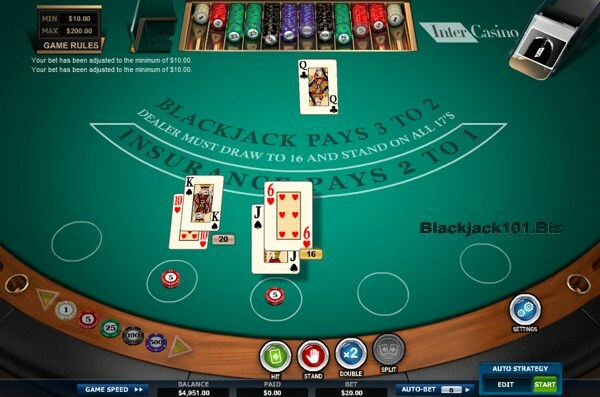 Players can find blackjack variants depending on the number of card decks used from a single-deck games to the games played with two, four, five, six or eight decks. In most blackjack games the dealer stands on soft 17, in the single deck version he hits. There are also other variations in the rules of the Cryptologic games concerning Splitting, Doubling Down, Insurance and Surrender policy. 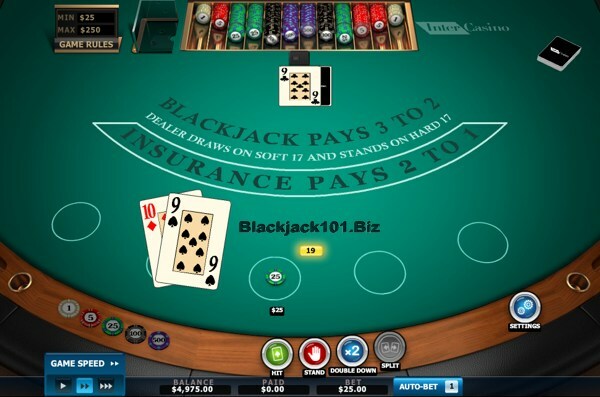 Only Vegas Blackjack offers Surrender option. 4 Deck Vegas Blackjack. This is an American Hole Card game with 4 regular card decks. The dealer peeks for Blackjack on 10 value cards and Aces. The dealer stands on all 17. Player's Blackjack pays 3:2. Doubling down is allowed on any first 2 cards. Double down after a split. Split once for a total of 2 hands. Split Aces receive only one card on each Ace. Winning insurance bets pay 2:1. The game can be played with 1 to 5 hands at once. Set bets in the ranges from $5-$100 to $500-$5,000. 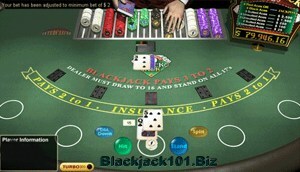 Atlantic City Blackjack Review. This is an American Hole Card game with 8 card decks of 52 cards. The dealer stands on all 17. The dealer peeks on 10 value cards and Aces for Blackjack. You can double down on any 2 cards; split only once (split Aces only once). Split Aces receive only one card on each Ace. Double down after a split. Winning insurance bet pays 2:1. No Surrender is allowed. Play in different modes with bets from $2-$50 to $500-$5,000. House edge is 0.49%. European Blackjack Review. 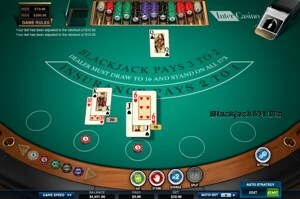 Here the dealer does not receive a hole card at the beginning of the game - the Dealer's second card is delivered following completion of all player's actions. Played with 6 card decks. The dealer stands on soft 17 or higher. 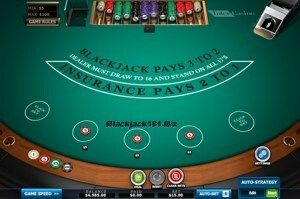 A player's Blackjack pays 3:2, winning insurance bet pays 2:1. You may double down on any first 2 cards. You may double down after a split. Split up to 3 times to a total of up to 4 hands. Split aces receive only one card on each Ace; you may not re-split Aces. No surrender. The player may not hit on a soft total of 21. European 2 Deck Blackjack Review. In this game the dealer does not receive a hole card at the beginning of the game round; the Dealer's second card is dealt following completion of all player's actions. Played with 2 card decks of 52 cards. The dealer must stand on soft 17 or higher. 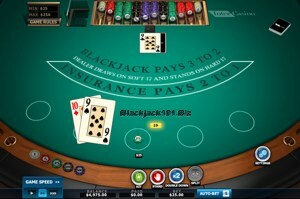 Blackjack pays 3:2, winning insurance - 2:1. Player may double down on any first 2 cards. Double down after a split. Split only once for a total of 2 hands. Split Aces receive only one card on each Ace. Choose bets from $10-$200 to $500-$5,000; the minimum bet is $10. 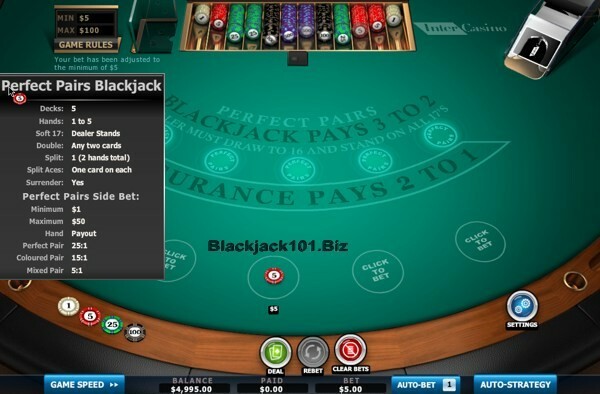 Perfect Pairs Blackjack Review. 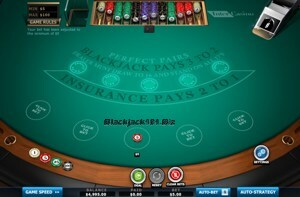 Based on the hole-card version of Blackjack, Perfect Pairs Blackjack is very similar to the Atlantic City and Vegas blackjack variants with some small changes. There is an optional PP side-bet based on the player's first 2 cards and the popular Surrender option is included. 8 card decks. The dealer stands on all 17. The dealer peeks on 10 value cards and Aces. Bet from $5 to $100 per hand. Player's blackjack pays 3:2. You may double down on any first 2 cards. You may double down after split. You may Split only once. Receive only one card to split Aces. Progressive Blackjack Review. 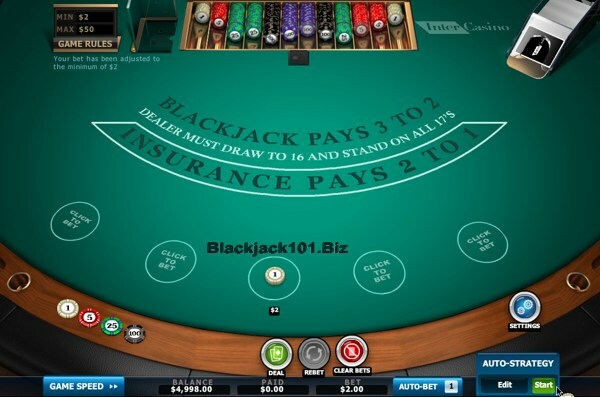 This game has the same rules as the Atlantic City Cryptologic Blackjack but offer optional $1 progressive side bet that can deliver you a huge jackpot payout. 8 decks are used; re-shuffled after each hand. The Dealer must stand on all 17's. The dealer peeks for Blackjack on 10 value cards and Aces. You can double down on any 2 cards. Double down after split is allowed. Only one additional card allowed on each Ace to split a Pair of Aces. No surrender. Minimum progressive jackpot (seed) is $/£/€ 50,000. Single Deck Blackjack Review. The rules are based on the traditional hole-card game that is popular in North America. With a $25 minimum bet, and the lowest house edge (0.21%) in the Cryptologic Blackjack suite, this game is sure to become a favourite among high rollers. This is the only Cryptologic game where the Dealer hits on soft 17's and stands on hard 17's. The dealer peeks on 10 value cards or Ace as the upcard. Doubling down allowed on any first two cards. Doubling after split is allowed. Only one split allowed. No surrender. 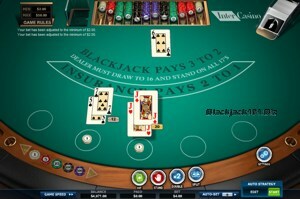 General Game Rules With blackjack at InterCasino you can play most games from one hand up to 5 hands at once. The dealer always stands on soft 17 (Ace & 6) excluding single deck version. Doubling down is allowed on any first two cards and you even can double down after you split pairs which is better than what land based casinos usually offer. Double after split is not allowed only in the single deck version. Split Aces receive only one more card. When the dealer's face-up card is a ten or an Ace (in most games, except 2 European type games) he peaks under the face-down card to tell you if he has a Blackjack. Cryptologic multi-deck blackjack versions make card counting quite impossible, because the cards are shuffled after every hand played. It is now difficult to find an online casino making card counting easy anyway. Blackjack Pros will choose single deck version. The default table limits are from $2 to $100. But you can play on a bet range from $500 - $5,000. You can change the largest table limit once you have received your PIN via regular mail. The most popular Cryptologic casino, InterCasino offers regular players bonuses each month (up to $100 monthly or $1,000 a year) and good Comp program giving you 1 - 3 points per each $10 bet. For a $25 fee you can also play monthly "Blackjack Challenge" tournaments and win up to $3,000. 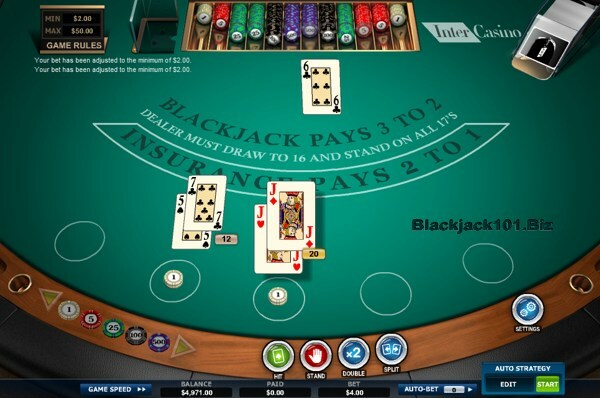 You can download InterCasino software and play all above-mentioned Blackjack Games for practice or for real money. New members receive 100% match bonus up to $300 on their first deposit. Real money players will enjoy regular promotions, monthly BJ tournaments, quick payouts of winnings and great quality games of the recently updated International casino. See also Progressive Blackjack Jackpots and Cryptologic Winners' Stats.